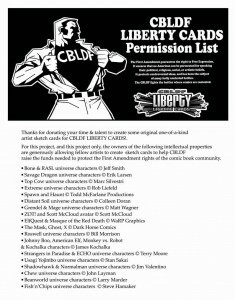 Last winter, when we first started doing all the plotting and planning for CBLDF Liberty Trading Cards we first came up with a list of folks we cast a wide net and see who in the extended community of comic book artists & illustrators might be want to lend a hand creating some sketch cards for us. The characters owned by the biggest of the big boys all have trading card licenses. So, we went right to the creators that own and control their own characters. 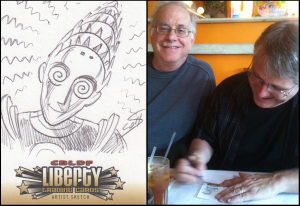 It was a simple pitch: I asked the creator to consider lending CBLDF the use of their characters for CBLDF Liberty sketch cards. I held my breath waiting. It’s a pretty audacious thing to ask someone. Oh, but the response was astonishing! You can see for yourself by checking out the document below, a document given to every artist that decided to draw some cards for us. More later about how that came about. I can’t begin to express enough thanks to these brave men and women who have entrusted me to take good care of their characters for the duration of this CBLDF project. It’s an incredibly generous act. 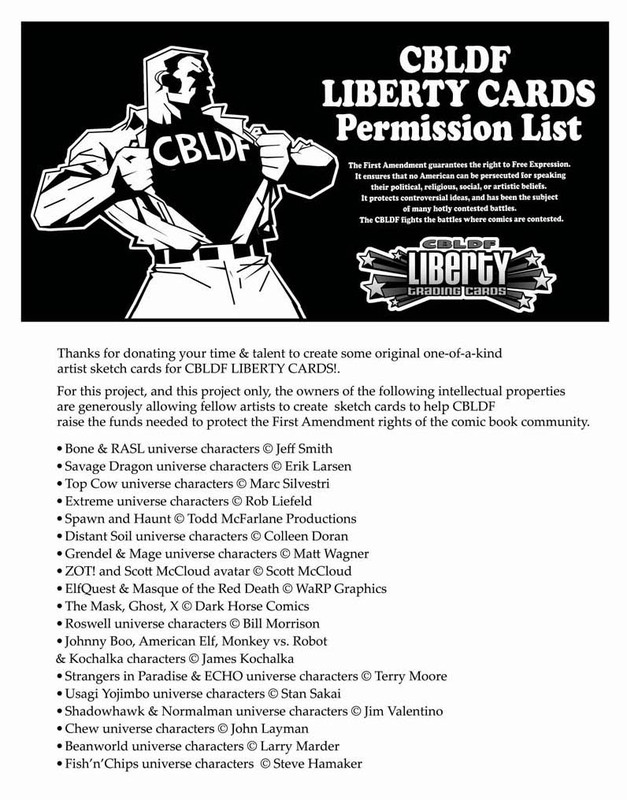 They are helping support our comic book community’s constitutional right to freedom of speech. 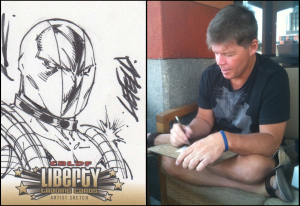 In the coming days and weeks, I’ll be revealing all sorts of cards from the set including: bonus sketch cards, bonus autograph cards, and the base cards that tell the history — told in words and pictures — of comic book censorship in the United States of America. Today I’ll start with two of my favorite friends from my years in comics. 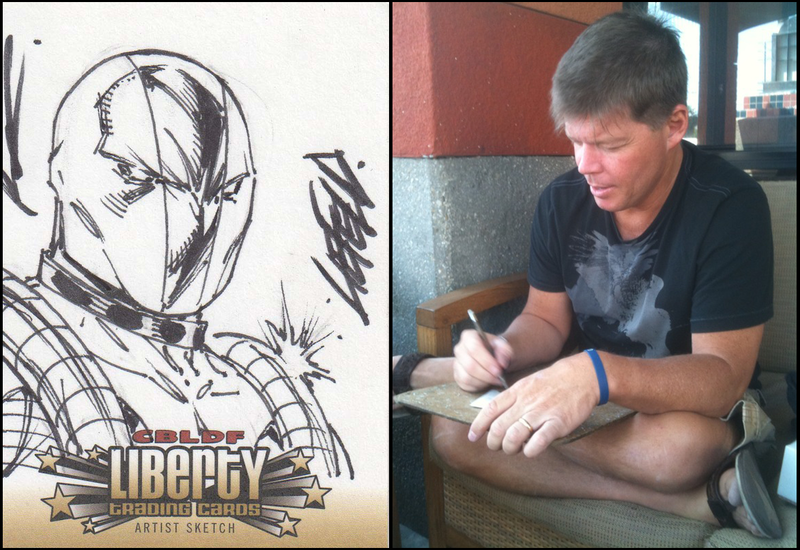 Last week, as we were kibitzing about the industry, Rob did autographs and sketch cards for us. 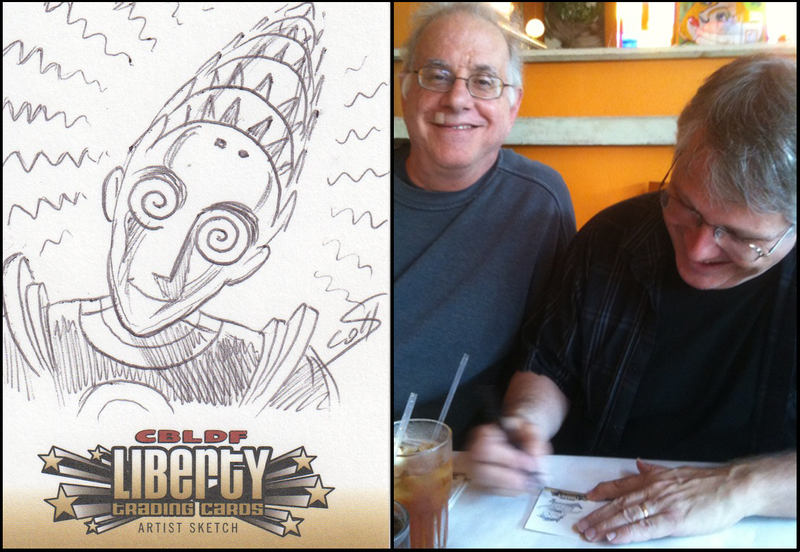 And then there is my ol’ pal, Scott McCloud. The guy sitting next to Scott with the goofy grin is me. I have that look on my face because I’ve known Scott for a quarter century, and let me tell ya he is someone who isn’t easy to get to do any kind of sketching at cons or signings. But here he is, with documentary proof that Scott believes enough in the Fund and our first amendment work that he was willing to donate his time and talent to us. The card is of Dekko from Zot! I’ll be back on Thursday with more!